Hind pair of wings may be missing, or are much smaller than fore wings. Adult mouthparts are either missing or reduced. Adult male legs modified for grasping female during mating flight. 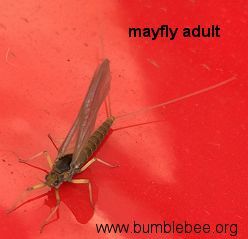 Mayflies are the only insects that moult after attaining the winged state. 2 or 3 terminal abdominal filaments in adults, 3 in nymphs. Nymphs aquatic and long lived, 3-4 years in some cases. Often called "the most primitive insects with wings". Oldest existing order of winged insects. Many of the common species were given their names by anglers. They have a low tolerance of pollution, so the presence/absence of the nymphs is often used in the assessment of water quality. About 3100 species worldwide, 650 species in North America, 350 in Europe, 51 in British Isles. The Ephemeroptera are thought to have evolved towards the end of the Carboniferous. Mayfly nymphs are mainly herbivorous (some are carnivorous or even cannibalistic) feeding off algae and plant debris. They breathe though a series of tracheal gills, usually seven pairs, growing out of the side of their abdomen - see the drawings below. Mayfly nymphs spend their lives in water, usually preferring clean water, so are rarely found in polluted waterways. So their presence is usually an indicator of relatively unpolluted water. The nymphs live in the mud or among water plants. Ephemerella sp. (above) are usually found creeping along the mud or on stream and river beds, and occasionally cover themselves with debris. Development to adult state can take as long as two years in colder regions, but only a few months in warmer areas. During this time the nymph can go through as many as 45 moults (Stenacron interpunctatum canadense)! During the final instar the nymph will stop feeding for a while, then climb out of the water or float to the surface. Then within a few seconds the skin splits and the insect emerges in its final nymphal stage and flies off. Mayflies are the only insects that have fully functional wings before they reach adulthood. Within a few hours, or in some species minutes, this nymphal skin is also moulted and the insect emerges as a full adult. Acid rain has led to the loss of many populations in Northern Europe and America. Adult mayflies do not live very long, some just for a few hours while others can hang around for a few days. Dolania americana lives for less than five minutes after her final moult. During those five minutes she chooses a mate, mates, and lays her eggs. Mayflies are weak fliers, so rarely stray far from water unless the wind carries them. Their whole purpose as adults is to mate. Some of them have no mouthparts, and even those that do do not feed. Usually a large number of adults emerge in a synchronized hatch. The mass emergence of mayflies is actually a defence mechanism as the predators, mainly fish, bats and birds, are unable to eat them all, so many mayflies escape predation, and go on to breed. Mating swarms are most common in the late afternoon tto dusk in temperate regions. Males dance to attract the attention of females. The attraction seems wholly visible as no pheromone has yet been discovered. The female flies into a swarm of males. A male grabs her, and mating proceeds. Mayflies mate on the wing. A female can produce anything from 100 - 12,000 eggs, but most species produce 500 - 3000. Parthenogenesis (reproduction without mating) occurs in around fifty species. Egg release varies with species. Some release their eggs all in one go, and these then separate when they land in the water. Others release their eggs in batches either in, on or over water, and a few species actually position their eggs by crawling underwater to lay them in a suitable place. After this the adults usually flop into the water where they are the beloved food of fishes, something well known to anglers.